Whether you love kale (yet) or not, the health benefits of kale will have you singing it’s praises and putting it on the table regularly. Let’s have a close look at kale in all it’s facets: kale description and history, the benefits of kale, growing kale, how to cook kale and great kale recipes. Botanical Name – Brassica Oleracea Acephala, meaning cabbage without a head. Kale is an amazing vegetable and one of the healthiest you can eat. It is a member of the cruciferous family of brassica vegetables that includes broccoli, cauliflower, cabbage, brussels sprouts, kohlrabi, Asian greens, rapini and radishes. There are many varieties of kale cultivated and eaten around the world. Many varieties have the curly leaves that we usually associate with kale, while others like Tuscan, Siberian or Russian kale have longer, textured leaves. In fact, Tuscan kale, properly known as Lacinato, is referred to as a black or dinosaur kale because of the texture of it’s leaves. Tuscan kale has a slightly sweeter and more delicate taste than curly kale. You can even find kale in your flower garden. Ornamental kale can be purple, white or green. It looks like a loose head of cabbage with very ruffled leaves. Ornamental kale is edible too. It is more tender and milder in flavor than regular kale. Kale is grown and enjoyed around the world. It is called wu tou gan lai in China. The French refer to kale as chou cavalier or chou vert. In Germany kale is called blattkohl or kuhkohl. In Italy it’s cavalo da foglia and in the UK it has also been referred to as fodder kale, cow cabbage or borecole. Kale has been cultivated for thousands of years by ancient civilizations, including the Egyptians. In fact, it is thought to have been cultivated for more than 6000 years. At one point, kale is thought to have been the most widely cultivated vegetable crop in the world, later to be replace by the cabbage. Kale is thought to have been brought to Europe around 600 BC, probably by the Celts. It became as popular in Europe as it had always been in Asia and the Middle East. European immigrants brought kale with them on their journeys to the new world in North America in the early 1800’s. You can see that we have been enjoying kale for a long time all around the world. I am not sure what happened that caused kale to be less prevalent on North American tables, but it is certainly enjoying a resurgence in popularity, and a well deserved one at that. Kale is not only a tasty and very easy to grow vegetable, but the health benefits of kale are amazing, from cancer prevention to anti-inflammatory and cholesterol lowering properties. Kale plays a significant role in the reduction of inflammation. 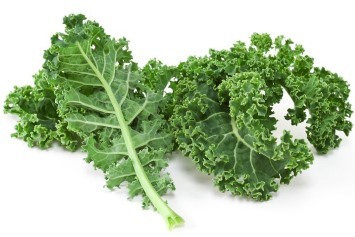 Researchers have identified over 45 flavonoids in kale, including kaempferol and quercetin. “Flavonoids, such as quercetin, are antioxidants – they scavenge damaging particles in the body known as free radicals, which damage cell membranes, tamper with DNA, and even cause cell death. Antioxidants can neutralize free radicals and may reduce or even help prevent some of the damage they cause. They also help keep LDL (“bad”) cholesterol from being damaged, which scientists think may contribute to heart disease. Kaempferol helps to de-activate carcinogens and is associated with reduced risk of heart disease. Both of these are found in all plant foods, but are found in very high amounts in kale. Kale also contains lutein and zeaxanthin which help to prevent age-related macular degeneration as well as sulforaphene and indole–3–carbinol, found exclusively in the Brassica family of vegetables. These last phytonutrients are implicated in DNA repair within cells and have been found to be effective at blocking the growth of cancer cells. Kale contains chlorophyll which has been shown to bind to potential mutagens and carcinogens in foods and aid in their elimination from the body. The beta-carotene in kale, including pro-Vitamin A carotenoids, support the maintenance of healthy cell differentiation, enhances the immune response, protects eye tissues and may suppress cancer development. Consumption of kale has been associated with a lowered risk for several cancers including breast cancer, ovarian cancer, colon, bladder and prostate cancer. Kale contains something called isothiocyanates (ITCs). Research suggests that these ITCs, made from the glucosinolates in the vegetable, play a primary role in cancer prevention. See more about kale and cancer in the phytonutrients information above. Kale can help to lower cholesterol, especially if it is eaten steamed rather than raw. Once cooked the fiber in kale can more easily bind with the digestive bile acids in your system. Raw kale does this too, but a little less effectively. Kale is rich in Vitamin K, shown to be a key nutrient for helping to regulate inflammation in the body. Read more about kale and it’s anti-inflammatory properties in the phytonutrients information above. Kale contains substances called goitrogens. Goitrogens can inhibit the body’s ability to absorb iodine, which could be detrimental for anyone who has hypothyroidism. Cooking kale can lessen this effect, but if you have any kind of thyroid issues, please check with your health care practitioner before consuming kale on a regular basis. Kale has a very high Vitamin K content. That’s a real positive for most of us, but if you are taking some anti-coagulation (blood-thinning) medications you may need to avoid kale. The Vitamin K in kale can reverse the blood-thinning action of drugs like warfarin (also known as Coumadin). Vitamin K is present in most greens so talk with your health care provider about which foods to avoid. Always buy the freshest produce you can find and that goes for kale as well. Make sure the leaves are fresh looking and a rich green and the stems are moist and crisp. If the leaves are limp or ends of the leaves are wilted, yellowing or turning brown, you don’t want it. The kale will be old, tough and contain fewer nutrients. Smaller kale leaves will be more tender so if you are going to eat it raw, look for the kale with the smallest leaves. The small leaves are also milder in flavor. Kale should be kept in the refrigerator until you are ready to use it. I store my kale in a plastic bag (the one from the grocery store produce section is fine for a few days). I add a folded paper towel to the underside of the bag to keep it dry. Kale will usually keep fairly fresh in the refrigerator for about 5 or 6 days. Remember though that the longer kale is stored the more bitter its taste can become, so use it as quickly as you can. Also, don’t wash it (or any vegetable for that matter) until you are ready to use it or it will spoil more quickly. You can cook kale stems as well as its leaves. To even out cooking time, cut the stems into smaller pieces. If you cut the leaves into 1/2 inch slices, chop the stems into 1/4 inch sections. Another strategy to ensure even cooking is to begin cooking the stems a few minutes earlier than the leaves to give them extra time to soften and be cooked through. Steaming kale is a great way to retain its flavor and many of its nutrients. Steaming it for about 5 minutes is usually enough unless your kale leaves are quite large. If they are, just steam for a couple of minutes longer. Steamed kale can be used in many ways. You can add a bit of olive oil and lemon juice to it and just a bit of salt and pepper. Chopped onion adds flavor as well as red peppers. Add nuts for a bit of crunch or something like dried cranberries or fresh pomegranate seeds. Use the search box near the top of any page on the blog to see what kale recipes we have. And remember that I am constantly adding new, nutritious recipes, so bookmark the page and come back often to check us out. Growing kale is really easy. In fact it is considered one of the easiest vegetables to grown yourself as it isn’t “fussy” about the kind of soil it sits in or the treatment it gets. Kale seems to thrive in colder temperatures and actually gets a bit sweeter when it has been touched by a bit of frost. It grows in most climates though, cool or warm, quite easily. If you have a small space or live in an apartment with a balcony you can grow kale in containers too. Just make sure the seeds have enough space around them to grow. Follow the instructions on your seed package or buy seedlings and just plant them. You will have your own nutritious kale in a few months. Kale is one of the world’s super healthy foods. The health benefits of kale are fantastic as you can see. It’s a nutritional power house and certainly deserves a place of honor in our list of power foods. Try the many kale recipes on the site and add variety and great nutrition to your diet with kale nutrition. Get the health benefits of kale in this recipe for buttered kale with cranberries and pine nuts. If you like this page, please use the buttons below to Pin it to Pinterest, Tweet about it, Like it on Facebook and leave a comment.